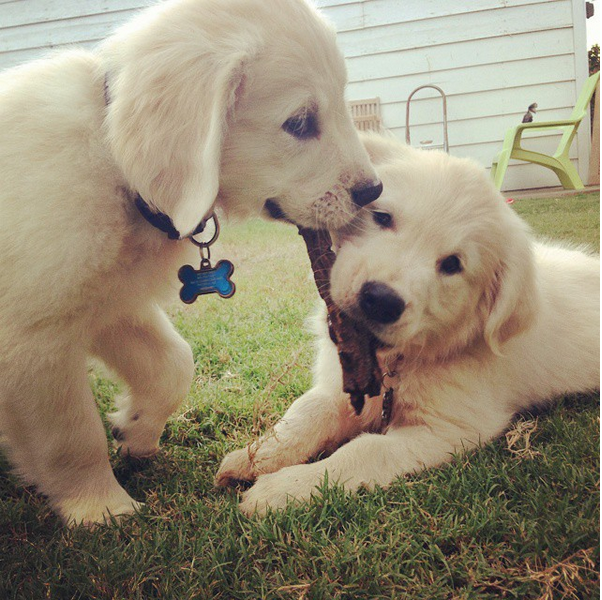 Chris and Nina Cardinal have two adorable golden retriever puppies named Colby and Bleu. 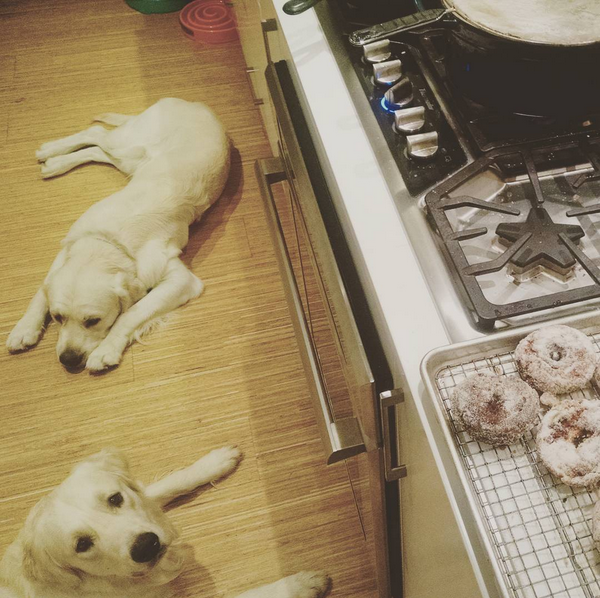 While at work, Colby and Bleu play in the couple’s bedroom, but as soon as Chris and Nina get home from work, it’s dinner time! The Cardinals set up Colby and Bleu’s dinner before letting them out of the bedroom because as soon as Chris or Nina open the door, it's off to the races! Bleu and Colby trip over themselves to get to their delectable dog food. One night, Chris and Nina decided to record Colby and Bleu’s infamous dinner run. After finding humor in the video, and thinking about it a little more, the two decided to continue recording the energetic pups and watch them grow up on camera. So, they began filming the dinner run periodically. After awhile, Chris decided to string the footage together and uploaded it to YouTube. The video was an immediate hit, having received 1.1 million views by the following morning. Shortly thereafter, the adorable duo were featured on Time, E! Online, and Daily Mail, among other websites. Today, Colby and Bleu’s meta timelapse video has over 12 million views. The two pups are 19 months and are still as mischievous as ever. Jukin: Describe your video. Why did it happen(background)? Chris: Initially if I got home from before my wife, the dogs would be in our bedroom and I would prepare the dog’s dinner. Once everything was all set, they would come tearing around the corner from the bedroom into the kitchen heading for their food bowls. I thought it was hilarious. Jukin: What made you pull out your camera to record? Chris: My wife was the one who suggested that we film them, so I decided to keep filming them every couple weeks so that we could sort of see how they grow up and develop. Chris: I didn’t really look at the footage beyond making sure it was in focus. I thought it would be really really cool to see the exact same framing and the same footage with the only thing changing is their growth and whatever dish towel my wife had on the oven. I finally decided to assemble them together and at the very last minute I decided to put how old they are. This was cool because people started pointing out which week was their favorite. Jukin: How did you feel when you saw the number of views on your video? Chris: I checked it when I was getting ready for bed and it was at 45 thousand views. I check it again about an hour later it was at 250 thousand views and then I checked it in the morning and it was has broken a million. I just thought this is insanity. It’s the power of the internet. Your dogs can take off and become popular. Literally millions of people saw my video. I mean I have 12.4 million YouTube views, but easily a couple more billion people saw it globally because of Daily Mail and some of the other international publications. It crazy how much coverage it ended up getting. Jukin: Why did you choose to work with Jukin? Chris: My uncle called me up and said I think I saw your dogs on the news. A New York local ABC affiliate ran the video on their nightly news which was awesome and then it was on Good America the next morning. Jukin: What do you think about your video now? Chris: I was really fortunate that I started the video at 11 weeks. If i had waited a week later, I don’t know if anyone would have cared if I shot a video from 18 weeks to 24 weeks. There’s just not enough of a difference. Jukin: What would you do differently? Chris: Honestly, it would be to change the music. It really took a chunk of my revenue. The music worked perfectly for the video, but I might have changed it. Overall, I’m really happy with how the video ended up turning out. Jukin: Do your friends and family know? Do they treat you like a celebrity? Chris: Everywhere we go people are always commenting on how great looking dogs they are, even before we made the video. It was cool to run into people that have seen the video already. 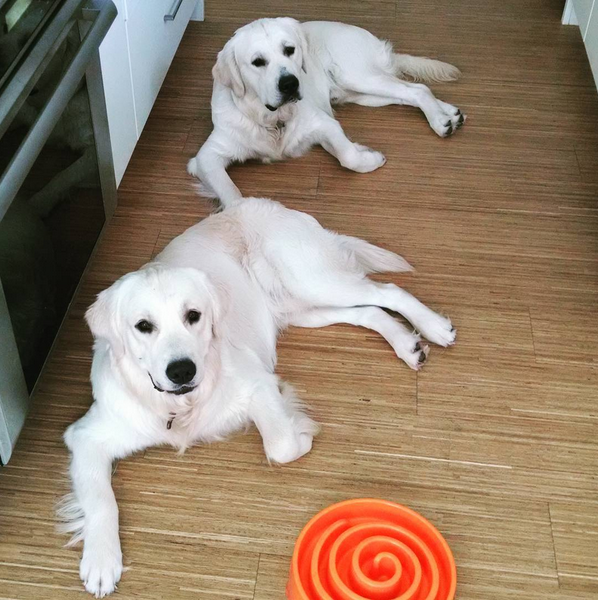 I would mention to people that I have two golden retrievers and people would ask me if I had seen the video with the golden retrievers running for their dinner. I’m not in the video anywhere. No one knows its me. Jukin: Any advice to the next big viral video owner? Chris: My advice is to sign with a company like Jukin immediately. My wife wanted to wait and I had to explain it to her. I said, “You don’t understand. This video is going to be popular for about 48 hours and then it's going to go waaaay downhill very quickly. The internet turns so fast and so powerfully that you have to strike while the iron is hot. I’m glad I signed on early. Jukin handled the licensing deals for me and made sure I got paid for it. I didn’t have to deal with any of it. Jukin: What part of this experience impacted you the most? Chris: It’s a great story, that's my favorite part. I do a lot of business development and networking. I tell people this story almost everywhere I go. It’s fun. They are really fascinated in someone who has had a video go viral. They are interested in how that whole process works. For more with these great golden retrievers, check out their Facebook or their Instagram @Cheesepups.